eSports titles to be played in official school championships. Players at MSSA's S A Schools Championships - Parklands College, Cape Town. MSSA's School eSports Championships now include HearthStone and VainGlory. HearthStone has been played at IeSF's 6th, 7th and 8th World Championships. All the South African representatives did well, and all just missed getting out of the group stages. 2017 also be the first time that VainGlory shall be played as an official title in South Africa. The first event for Schools is the Online Inter-School Provincial Championships which shall be played on 11 February 2016. Any affiliated school may play in the Online Inter-School Provincial Championships and such event counts towards Provincial Colours as well as qualifying for National Team Trials. The same National Team Trials shall be used to select the Protea eSports Team that shall attend IeSF's 9th World Championships. Jeppe Boys readies itself for an exciting year. 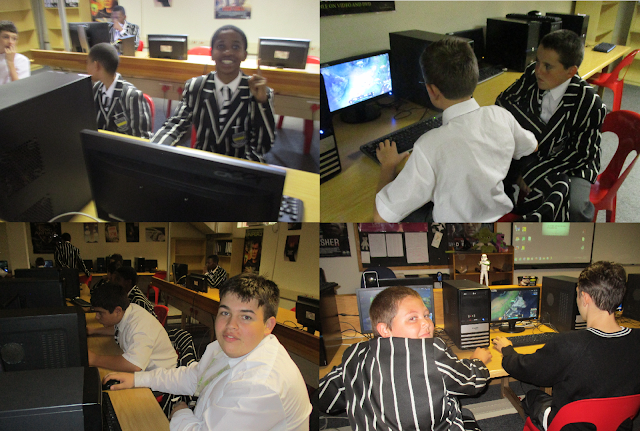 There is excitement in the air as Jeppe Boys esports team are in hard training for the 2017 season. The learners are all excited for MSSA's Schools Online Championships as well as for MSSA's Gauteng Provincial Championships. 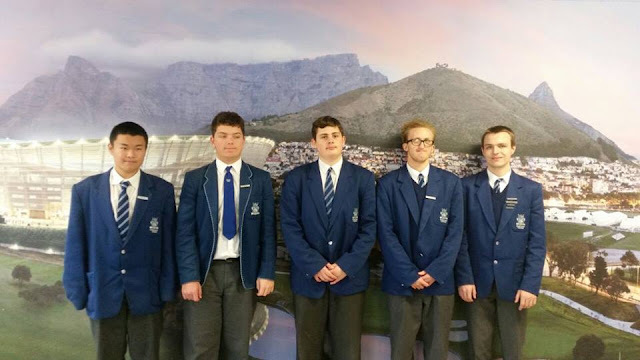 Jeppe Boys is one of the more active schools and participate not only in the above two events, but also actively compete in MSSA's ladder events. Jeppe Boys esports teams are also ranked on both senior and school ranking for the titles in which the school participates. Sunday, 29 January 2017 saw the Old Edwardian Wargames Club hold its 28th Annual General Meeting. No fewer than 62% of the membership turned up to the AGM. After noting the sad passing of Sylvia Webster (who was a member of the sub-club from 1989 to 2016), business commenced. At such AGM, the sub-club saw a changing of the guard, with Jason Batzofin being elected in as the sub-club's 4th chairperson. Jason is determined to get the club to become more involved in esports as it already has a strong pedigree in the wargames discipline. Even Jason is a twice Junior World Champion for wargames having won such title in 2014 and then in 2015. Jason Batzofin, who is also MSSA’s Player Representative and has also earned his Protea Colours for CounterStrike: GO in 2015 and then again in 2016 for his role at the Protea Team Manager. The Old Edwardian Wargames Club has had representation in every national team for figure games since 1991 in international competitions on an annual basis, and has established South Africa as one of the top wargaming nations. MSSA is proud to announce that it will once again hold its Annual School Provincial On-line Championships on 11 February 2017. Since the last notification, the Management Board noticed an egregious oversight in that HearthStone had not been included. The Board swung into action, and by following proper procedure have now included HearthStone into all school events. The championship may be used by gamers to qualify for eligibility to compete in the National Team Trials should the MSSA need to choose a team for any of the titles played in such championships. The MSSA School online Championships has become South Africa's largest official online championship. It is an event that lasts from 10H00 until 18H00 and is most enjoyable. The MSSA would also like to take this opportunity to thank all the dedicated Educators for ensuring that the school teams are ready-and-able and for giving up so much of their time and patience. Only once the learners have left school will they really comprehend what the Educators have done for them. The championship would not be possible without the continued support from Educators. Any player/team who is a Registered Player affiliated to a school club affiliated to MSSA may enter. Entry is free to all full-paid-up Registered Players. Only fully-paid-up Registered Players may participate in this event. Entries need to be submitted by no later than Wednesday, 8 February 2017. To register, the Educator-in-charge must complete the Google Drive document. MEN: The top three places (1st, 2nd, and 3rd). WOMEN: The top three places (1st, 2nd, and 3rd). School Provincial Colours: All Players that win all of their Matches at a Provincial Championship will earn School Provincial Colours. All Players who score within the top 50% in a specific Period at a any two (or more) Provincial Championships, and who also score within the top 50% at a National Championship in the same period and in the same year, will earn School Provincial Colours. The first round will start at 10H00. Players shall be given 60 minutes to complete each round. Players must all be on-line at 9H00. The ability to qualify for National Team Trials. As usual Trials shall be done at a LAN venue, and the team that can best represent South Africa shall then be selected. The MSSA shall decide who may shout-cast the games. Registrations are open for MSSA's 2017 Gauteng Provincial Championships. MSSA's 2017 Gauteng Provincial Championships is part of the process of selecting the 2017 Protea teams that will attend the various World Championships. All gamers are reminded that MSSA's 2017 Gauteng Provincial Championships are an open championship. In other words any registered player is entitled to enter the championship – no matter where they live, or their category of membership. Member clubs may enter their teams/players on their Google Drive page. The 2017 Calendar of Events may be viewed here. Sylvia Webster held high by fellow team mates (from the left) Butinyana Mothibedi, Don Malambe, Samuel Pule, Petrus Mqoshekile, and Gregory Kupczyk. Sylvia Webster was one of the great unsung heroes of Mind Sports South Africa. Few knew that Sylvia, was part of the first Morabaraba team to ever officially represent South Africa. Such team attended TAFISA's 2nd World Sport for All Festival in Bangkok, Thailand. The team was one of the most successful teams ever having won gold. The team also turned heads and attracted huge amounts of supporters when the team demonstrated the game and handed out free samples of the game. Such was the interest shown, that extra police had to be deployed to control the crowds. Yet Sylvia was not deterred. Even though Sylvia was diminutive in stature, Sylvia had the heart of a lioness. Little, if anything scared her. Even though Sylvia was a formidable Morabaraba player (which Sylvia credited to her degree in Mathematics), Sylvia was drawn into helping administrate MSSA itself. However, Sylvia never sought elected position. Sylvia was ever happy to work behind the scenes ensuring that events went off smoothly. Without Sylvia's help and expertise, MSSA would never have been able to have hosted 5 out of the 6 world championships hosted by MSSA. Such championships in which Sylvia was involved were those held in 1997, 1999, 2002, 2007, and 2012. 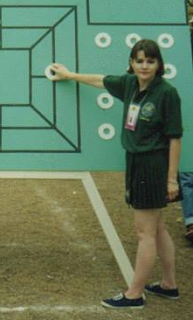 Sylvia's contribution to the Checkers test match between Hugh Devlin (of Ireland) and Lubabalo Kondlo (of South Africa) in May 2001 was truly phenomenal. Little, if anything, was too much trouble. Sylvia too threw her heart-and-soul into SK Gaming's visit in 2008. Nothing was too good for 'her' Swedes and she treated them royally. Through her efforts, Sylvia built up a world-wide network of friends, all of whom she loved dearly. Sylvia tackled all her problems head-on in her quiet unassuming manner. She kept all her successes and hardships private. All except for her ultimate joy in life, her son, his wife and their son. David, Kelly, and Cooper were her life. Of them, Sylvia would speak often and with much love. With Sylvia's passing the world has become colder place, but her spirit will remain as bright and cheerful as ever, and Sylvia, although having gone too soon, will remain forever young. There will be a memorial service for Sylvia Webster in the Round Table Room, Old Edwardian Society, 11 Ninth Ave., Lower Houghton on Saturday, 28 January 2017 at 14H00. Those wishing to attend must please RSVP to the Club Administrator, Celia Niederhoffer on 011 728 7335. 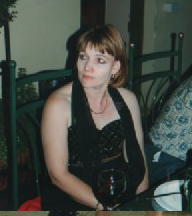 Sylvia Webster at IWF's 1999 World Championships Award Dinner in The Castle, Cape Town. 34th MSSA Gauteng Board Gaming Championships - Jeppe high school for Boys on 25 February 2017. The 34th MSSA Gauteng Board Gaming Championships shall be held at Jeppe High School for Boys on 25 February 2017. The championships shall start on both days at 9H00. Players need to register at least 30 minutes before the start of play. Entry fees are: R30.00 for board gamers. Only players who are registered with fully-paid-up members may participate. Players are reminded that the majority choice of rules as at the closing date for entries shall be used. Entry fees can be deposited directly into Mind Sports South Africa's account, held at ABSA Bank, account number, 90 4766 7676. All entries must be entered onto the club's Google Drive before or on 20 February 2017. UNIVERSITY: Medals shall be awarded to the first three players who are currently registered at any officially recognised University, provided the players have not received any Premier Medals. WOMEN: Women will be awarded medals as per the same basis as above, that is in all three categories. National Colours: All Players that win all of their Matches at a National Championship will earn National Colours. Provincial Colours: All Players that win all of their Matches at a Provincial Championship will earn Provincial Colours. All Players who score within the top 50% in a specific Period at a Provincial Championship, and who also score within the top 50% at a National Championship in the same period and in the same year, will earn Provincial Colours. National Team Trials: All Players that score within the top 20% or top three places, whichever is greater, in a specific Period at a Provincial or National Championship will earn an invitation to National Team Trials. National Team Trials shall be held in the event that a National Team must be selected to represent South Africa when competing in such Period in an International Championship. The next provincial event is: MSSA's 21st NORTH WEST Championships that shall be held on 25 & 26 February 2017. Mind Sports South Africa (MSSA) is an affiliate of the International eSports Federation, Federation de Jeau du Mondiale, and the International Wargames Federation. Due to its membership of such international bodies, the MSSA is the sole authority for the games that it caters for in terms of the Sport and Recreation Act, number 110 of 1998 (as amended). The MSSA is responsible for the good governance and promotion of Historical figure games (also known as wargames), Board games (such as Diplomacy, Checkers, Draughts, Morabaraba, Sport Stacking, etc), Card Gaming, Robotics, and eSports (whether they are played on ‘cell phones, Sony® PSP’s, personal computers or similar). 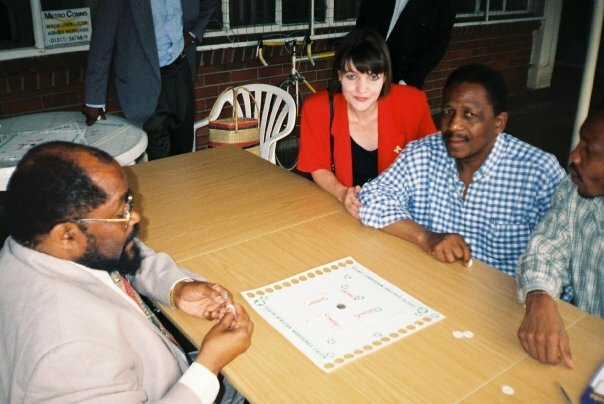 Mluleki George (left) playing against Matthews Phosa (right) in a game of Morabaraba. The bleakest of moments are sent to try and test the strongest of people. This is how character is revealed. It is in these moments of tribulation that a person weighs everything that they have done, and in gut-wrenching moments may attempt to value the worth of the people around him/her and the achievements earned. In my opinion achievements fade into insignificance when compared to the worth of an individual, but the friendship, concern, and comfort of others is paramount. It is all about people. That is the essence of MSSA. Even though it does not seem so, MSSA, has created friendships between the most unlikely people and close bonds that become evident at times of grief or hardship. Thank you to to the volunteers, without you, nothing would be done. While clubs that have financial backing repeatedly go overseas to participate overseas, the majority of clubs do not have the resources to do so. As a result the difference in the standard of play becomes more and more marked as the ga[p continues to widen between the various players. Ultimately, to have such a great divide in the standard of play in South Africa is not beneficial. Like in all sports, if there is only an improvement at the top, the sport will fail to meet long-term goals of inclusivity and general growth. What is required is that there is an overall improvement of the average. It is far better to have more teams at the top, as it forces a greater competitiveness as well as greater levels of improvement. I can personally attest to the enormous improvement of the standard of play of players who have competed in international competition. To put it in a 'nutshell', the player that comes back from an international championship is so much more than before he/she went. This is where Mind Sports South Africa comes in. Yes, clubs affiliated to MSSA may apply for National Lottery Funding which will assist them getting overseas. However, more importantly, MSSA's system of selection is not based on financial well-being but on being able to deliver the 'goods' at MSSA championships, and at National Team Trials. Thus MSSA team trials offers every gamer the opportunity to fight for a place in the National Team. Being in such a team will ensure that you face-off against the top national teams that the world has to offer, and by doing so will improve your competitive edge. Being selected for the national team is quite life-changing. And that is what MSSA is all about. Jason Batzofin in action against Sean Barry at MSSA's 2016 Gauteng Championships. The 34th MSSA Gauteng Wargaming Championships shall be held at Jeppe High for Boys, cnr Roberts Avenue & Good Hope Street, Kensington, on 25 & 26 February 2017. In terms of the current regulations, any period may be played to more than one rule set if there are sufficient entries, and a player qualified to act as an umpire has volunteered to umpire such rule set. Please note that if there are not at least 10 players entered for a figure gaming period, then such period shall be played to four (4) rounds and not five (5). Entry fees are: R60.00 for figure gamers. Entry fees must be deposited directly into Mind Sports South Africa's account, held at ABSA Bank, account number, 90 4766 7676. All entries, and army lists (if applicable) must be e-mailed to the the head of umpiring: Jessie Joubert at Joubert.jessie@gmail.com on or before 20 February 2017. Official School StarCraft II rankings. Update on MSSA's Calendar of Events. Not yet available in SA. Getting ready for the 2017 season. Do you want to be a Regional Director? WESG: Group A for Starcraft 2 is complete. WESG: Edwin Williams wins his second game. Nominations required by 15 January 2017. Growth is not the responsibility of the few! A loss is a loss. Who may host a MSSA Provincial Championship? In for a second term! Redefining what it means to be a student athlete.